One of several small Cascade lakes in the beautiful Deschutes National Forest near Bend, Oregon, Elk Lake is a popular summer destination for sailing and windsurfing. A sparkling alpine lake with amazingly clear waters. Brook trout and Kokanee salmon await enthusiastic anglers. Afternoon winds provide good conditions for windsurfing and sailing. Just 25 miles west of Bend. Elk Lake, Oregon is a beautiful little lake nestled in the Deschutes National Forest. With spectacular views of nearby Mt. Bachelor to the east, and the picturesque Three Sisters to the north, Elk Lake provides a very scenic setting for a variety of activities. During the summer, Elk Lake attracts windsurfers and sailors to its amazingly transparent alpine waters. Fishing, camping, hiking, and backpacking are also popular summer activities at this sparkling mountain lake. In the winter it’s a beautiful location for snowmobiling and cross country skiing. 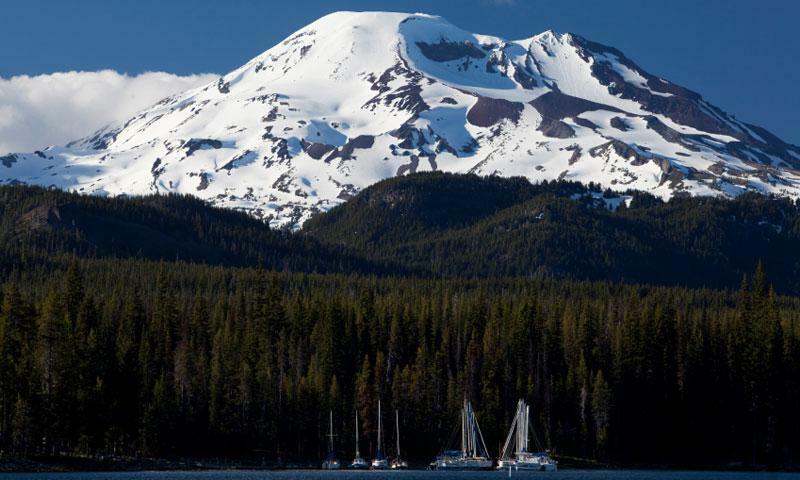 Elk Lake, OR is approximately 25 miles from Bend, located just 5 miles from Mt. Bachelor via the Cascade Lakes Highway. The lake is accessible only via snowmobile, cross country skis, or snow cat in the winter. Fishing – The cold alpine waters of Elk Lake in Oregon produce excellent Kokanee salmon, typically found in the deepest section of the lake at the south end. Brook trout ranging from 12 to 18 inches are also abundant in this lake. Windsurfing and Sailing – The afternoon winds at Elk Lake provide excellent conditions for windsurfing and sailing during the summer. Backpacking – The 17.8 mile Elk Lake Hike follows along beautiful Elk Lake Creek, past spectacular waterfalls, into towering old growth forest, and through the Bull of the Woods Wilderness Area. It has a 1,300 foot elevation gain. Camping – There are four campgrounds near Elk Lake in Oregon – Elk Lake Campground, Little Fawn Group Camp, Little Fawn Campground, and Point Campground. Bring your gear and enjoy a beautiful night out under the bright Central Oregon stars. Elk Lake has an elevation of 4,884 feet and a surface are of 405 acres. The deepest part of the lake reaches 75 feet. The unusually clear waters of Elk Lake make it possible to see the bottom from any point on the lake’s surface. Small, scenic lake at the base of Mount Hood.